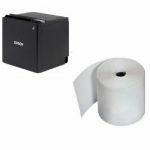 TM-T82II - The Epson's TM-T82II is a fully featured thermal printer which delivers fast receipt printing speed of up to 200mm/s and is backed by the industry's best-in-class reliability in high volume environments.Auto Cutter. Ethernet. ESC / POS. Epson Dark Grey. Incl PSU, IEC cable and Wall Bracket.With a MCBF of 60 million lines, an auto cutter life of 1.5 million cuts, and fast receipt printing speed of up to 200mm/s, the TM-T82II delivers best-in-class reliability so critical in high volume environments.The TM-T82II is designed for easy installation. Even if it is installed horizontally with its back directly against the wall, its cover can be opened, so no extra space is needed. If the accessory switch panel for vertical installation is used when installed vertically, easy operation is available with its good visibility. By attaching the wall hanging bracket to the bottom, the TM-T82II can be set with its front perpendicularly for installation to other devices. 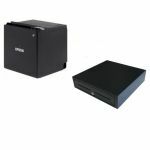 The Standard Cash Drawer is a 5 note, 8 coin cash drawer made from robust steel and designed to withstand even the most demanding point of sale environments. 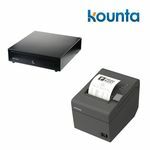 The Standard Cash Drawer comes with an RJ-11 interface and has dual media slots, metal noteclips and a 3 position lock. Available in White or Black. Dimensions 410(w) x 415 (d) x 100 (h).